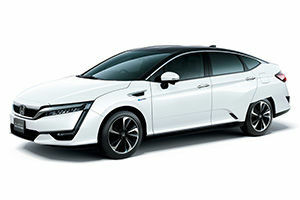 Honda Motor Co. began sales in Japan of its all-new fuel cell vehicle (FCV), the Clarity Fuel Cell. It is the world’s first five-passenger sedan type FCV, realized by making the fuel cell powertrain more compact using original Honda technologies and fitting it entirely under the hood of the car. Combined with the improved efficiency of the powertrain and a reduced energy requirement for driving, a 70 MPa high-pressure hydrogen storage tank installed to this vehicle provides a cruising range (for reference) of approximately 750 km (according to Japan cycle), an increase of approximately 30 % compared to the previous FCV model, in order to achieve the world’s top-class cruising range among all zero emission vehicles. The Clarity is priced 7,660,000 yen (60,369.95 €).